No, that’s not the first line of a joke. We actually had a goat show up at our house last weekend. Poor little thing seemed awfully confused. She is fairly tame, but won’t let us touch her. However, when she tried to follow me into the house, we took advantage of the opportunity to catch her and pen her up. Yes, she is living in Koda’s pen. Poor dog. He had to give up his dog house during the summer for Ruby the pig. 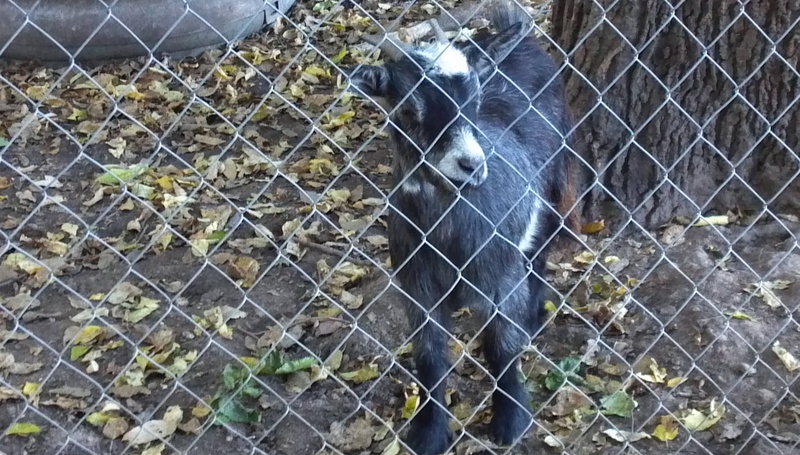 Ruby had just moved out and into a bigger pen, and now this … a goat. Needless to say, his pen will be getting a “makeover” once all of the farm animals have vacated. We don’t know of any one in 5 miles who has goats, so not sure how to find the owner. We may have just adopted a new pet. When animals find you I think it is a sign they are supposed to stay with you. Judging by the markings I’m guessing it is a Toggenburg or at least a Toggenburg cross. They are a dairy breed from Switzerland. I look forward to your adding goat cheese to your farm produce portfolio! Are you just making that up? I don’t think that’s a real goat breed …. Um …. no. The diversification of our farm is complete. For now, at least. …. oh yeah, and yarn spun from the fibers, that would be cool! But no goat cheese. That would be crossing a line. Absolutely not. Fresh goat cheese on sliced heirloom tomatoes. MMM… I can taste it already! You must listen to your customers.